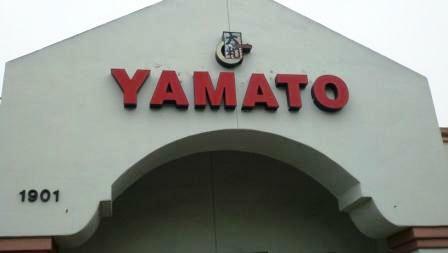 This past week, Yamato Restaurant at 1901 East Daily Drive in Camarillo closed its doors. There is a sign on the front door thanking us for our patronage and directing customers to its Encino location. This was quite a large restaurant, kind of dark and slightly dreary, yet a friendly feel with cheerful wait staff and having one of the largest sushi conveyor belts I've ever seen...larger than the one at Cho Cho San's in Thousand Oaks. Trivia time: What restaurant occupied this space prior to Yamato? I believe that would be Tony Roma's.